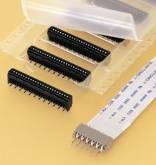 Both Dip (through-hole) and SMT types are available. SMT type connectors have heat-resistant housings so that solder reflow is possible. 3.0mm (.118") high <side entry type> and 5.1mm (.201")<top entry type>. There are no slides or leavers to operate on thie reduced insertion force connector. 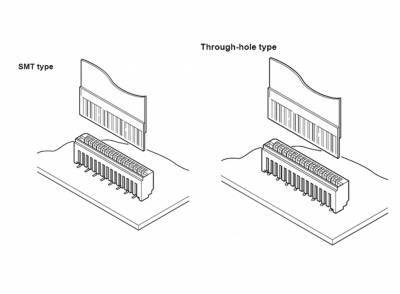 It requires 1/2 the insertion force of JSTs conventional FFC connectors, but retains stable contact performance when subjected to environmental and mechanical stresses. 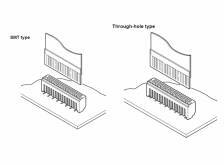 SMT type connectors have heat-resistant housings so that solder reflow is possible. They also have solder tabs for extra strength. The SMT type FMN connector is supplied in embossed tape packaging, for mounting by automatic placement machines.